Here's the perfect Valentine's Day gift. 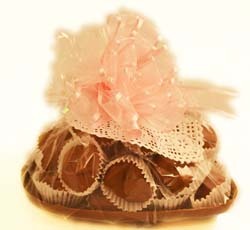 When your Sweetheart polishes off the Dorothy's Swiss chocolates and wants more, he or she can eat the dish! This adorable chocolate heart shell comes brimming with assorted chocolates and bedecked in Valentine's regalia then gift boxed. What a delight to the eyes! Wrapped in cello, topped with a ribbon and old-fashioned doily -- ready for gifting. From Allan Bluman of masontown, Pennsylvania on 2/20/2015 .